Message: This past Thursday dear friends invited me to Cincinnati for supper at an Italian Restaurant called “Tony’s”. My friends indicated to, Mr. Tony Ricci, I have a Theology of Dining and a Theology of Wine (which I believe is very Christian/Catholic). I teach (Vocation and the Arts) and coordinate the annual Chaminade Scholars Pilgrimage to Italy each year connected with spirituality and vocation I strive to cultivate a deep appreciation of the beauty of dining in my student’s lives! I believe our modern era has lost this quality “artistic experience in life! We live in a fast paced life that does not give us graced moments to enjoy the wonder and beauty of God’s earth gifts of food! This is a quality Catholic experience! Not eating for the sake of simply eating but eating to enjoy the wonders of the eloquence of each parcel of food. Somehow we touch the divine when we can experience all of creation in food not simply consumed but deeply enjoyed! Thus, I love to introduce my UD students to the quality of such dining for appreciate the beauty and wonder of food when we are in Italy. Well, let me tell you! This was my kind of Theology of Dining! The ambiance, food, care of the stewards/stewardesses and conversation was stellar! The wine had a delicate bouquet and gentle smooth taste that wanted you to simply savor each sip for a very long time! Each of the plates served were exquisitely presented. One pondered them before one even placed the fork and knife on the plate. As the evening proceeded Tony came and joined us occasionally sharing his story of how he became a restaurant owner (he now has two). He came as a child with his parents from Italy. He went to Purcell Catholic High School in Cincinnati. In High School he began a side job working in a nursing home serving in the kitchen. He began to see how happy his little special touches to meals were for the residents and decided the rest of his life he wanted to prepare food that made people happy! Now isn’t this a vocation? Imagine if every person decided to engage in their life’s vocation (position) simply to make other people happy! What a different world this would be! Our meal was touched off with a few deserts made by his mother. The tiramisu melted as it touched one’s lips and smoothly lingered with its generous flavor of brandy. Tony said: Brandy! Yes, Brandy, is the only way for a good tiramisu! He was correct! 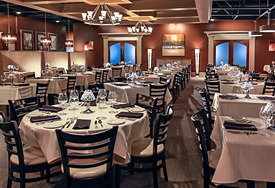 This is an experience, a depth experience of depth culinary dining no one in Ohio should miss!